Let's give it to History Channel top executive Dan Davids--sensational timing, Danny! And let's not forget his tact, oh yes. Much like his ratings-crazed news colleagues that jumped like circus canines to immediately broadcast those obscene photos of the Virginia Tech gunman. Never mind about the grieving families, or old-fashioned notions about decency. Not even a week has passed, with yesterday being the first of a long line of memorial services and funerals for the slaughtered young people. And still, Davids just couldn't resist last night throwing at us a rerun of "Jonestown: Paradise Lost", graphic portrayal of another mass-murder. It was just two days ago that we had a national day of mourning. Why on earth couldn't Davids have at least waited a little while? Nothing against the docudrama per se, outside of a couple of serious flaws, the primary one being director Tim Wolochatiuk's turning to those notorious cult apologists Becky Moore and Mac McGhee for "expert advice". The nagging question: Is this the kind of programming that we really had to have now?? Jonestown, of course, produced more victims, under entirely different circumstances. But these tragedies both share the same senseless criminal essence. Investigators of such atrocities have to uncover the causes and establish accountability, which the media is obliged to report. We know our "safety-first" friendly gun lobby, National Rifle Association (NRA), has done whatever it takes to allow the most unhindered flow of guns to the public, even fighting to put "cop killer" armor-piercing bullets on those gun store counters. These fanatics have a stranglehold on Congress. In such an atmosphere, it's hardly surprising that former mental patients like the Va Tech killer could get hold of the weaponry to go on a murderous rampage. It's no surprise, either, how Jim Jones was able to carry out his murderous rampage, on so many more people, albeit a dramatically different setting. The real question, still, is on accountability. The media keeps on pretending they were on top of it, because reporters like Marshal "Pursued 'Em Early & Often" Kilduff say so. Negligent and dishonest. California politicians and clergy--in particular Rev. John V. Moore--pretend they knew nothing until too late about this cult's nefarious nature. Negligent, spineless, and even more dishonest. But the worst of the lot are the collection of cult apologist "New Religious Movement" scholars that infest universities across the nation, from Rev. Moore's daughter, Becky (San Diego State), to John Hall (UC-Davis), Catherine Wessinger (Loyola), Jeffery Hadden (Univ. of Virginia), and scores of others. These people are the most insufferable, because they are hard-working shills for religious cults that ruthlessly brain-wash, enslave, and abuse others, often children. They are wonderfully adept at disingenuous arguments coached in fancy academic language designed to confuse readers with half-truths bathed in fantasy. There's a nagging suspicion that one of them, a certain retired member of Columbia's academic community, went on something of a rampage against this blog in a rambling, fuming attack in one of the comment sections. She neglected to identify herself beyond leaving her first name: "Gillian". But I'll wager--and she's welcome to correct me if not so--that this is the very same Gillian Lindt listed in the "Scholarly Resources" section (brimming literally with a who's who of apologists, including Godfather of Cult Promoters and vampire enthusiast, J. Gordon Melton) of the Moore/McGhee Jonestown-Wasn't-So-Bad propaganda website. Fess up, now, Gill; did Becky and Big Mac send you? In any event, I wish you luck in continuing to try "to make sense and figure out" the serious problem posed by cult apologists and deluded film makers who concoct twisted, sugar-coated portraits of a monstrously destructive cult called People's Temple. Nationally recognized cult counselor Steve Hassan recently commented about Nelson's "Jonestown" film, the one you argue contributes "something enlightening" to us. "I was deeply affected by the documentary," writes Hassan, "as it brought back in powerful detail much of what I felt back in 1978 that made me want to dedicate more time to fighting cults. I have met Grace Stoen and was supposed to testify before a hearing convened by Bob Dole in Washington DC. It was that taken over by cults and all ex-members were taken off the agenda and cult leaders were invited to speak. They pulled this off by having cult members picketing with signs like "Elect Bob Dole President, Repeal the First Amendment. http://JonestownApologistsAlert.blogspot.com. Basically his father Les Kinsolving investigated Jones and wrote articles to expose him way back in 1972, but because Jones was politically connected, his father's work was suppressed and minimized. "There was a lot of evidence that Jones was very warped and corrupt from much earlier on than this film suggested. Kinsolving feels that Moore and others who were defending Jones during the days of the People's Temple show them to be very biased and I think that is true. They were painting a very idealistic picture because in the mind of members, that was why they were involved. "My problem with the Documentary is that while they did have ex-members stating facts, like 'Jones's words were blaring 24/7 at the compound at Jonestown', 'We were only sleeping 2- 3 hours a night' and 'People were afraid that they might be turned in by their family and friends if they ever said any negative about Jones (paraphrase)', the documentary didn't go into enough detail about what mind control is and how it works. There were some very interesting deleted scenes--especially the segment about Grace and Tim Stoen's son, and also Tim Carter's explanation for how he got away from the compound. "Factually there was much left out of the documentary. "They did dig holes and put children in them and tell them there were poisonous snakes and dangle ropes. They did do multiple rehearsals for drinking poison. Jones had taken all of their passports away. There was massive welfare fraud concerning many of the adopted children. "Deborah Layton was a courier and transported huge sums of money to Switzerland for Jones. Ex-member Jeannie Mills and her family were mysteriously murdered in San Francisco and so much more. I think they could have done better edits to portray Ryan as the hero he really was. He actually listened to the concerned families and actually did something about the problem. Unfortunately, no politician has been willing since to put his or her life on the line to help people in cults- in the U.S or anywhere...."
It's interesting how Stan Nelson just couldn't seem to track down Steve Hassan, or any other genuine experts such as renowned social psychologist Dr. Phillip Zimbardo, to add to his film's "enlightenment." He opted instead for interviews with raging cult apologists like John Hall and Becky Moore. What was Moore smoking when she invented this claim about the Jonestown day of mass-murder? "....Members of the Jonestown community did not see themselves as participating in a violent act," she wrote, "On the contrary, they saw themselves taking their leave quietly, peacefully, and yet as an act of protest. Jim's final recorded words demonstrate this...."
Oh, right. "Jim's final recorded words." Now there's some scholarly, bona fide testimony that perfectly complements the record of all the dead with injection marks between their shoulder blades, and the Jonestown prisoner whose so struggled that every joint had been torn out of her body, and the little children and infants who were force-fed the cyanide. One thing is certain. Cult apologists are worthy to appear in film. Not, however, to "enlighten" us about cults. Their time would be better spent in documentaries on the clinical behavior of people trapped in denial. As for most of our frequently shameless, self-serving media, as demonstrated by their behavior in recklessly broadcasting Va. Tech gunman's photos--a great incentive to publicity-craving copycat maniacs--they are just one rung below all this. They'll have promoted the lie that the Jonestown massacre was inevitable long enough now that it qualifies for the Big Lie Award. Moreover, they'll continue covering up their yellow streak from not closing down Jim Jones in 1972. None of the media, or our "Jonestown: Paradise Lost" director, or of course the mighty Lord Nelson, wants to reveal there were the devastating Examiner exposes rolling out in 1972, which one of Jones's inner circle said "drove Jones up the wall." They would have done more than that, had media editors just had any insight and backbone to allow the investigation to continue. Instead, they proceeded to serve up the cult's public relations about its "good works"; much like today, thanks to propagandist Stan. It seems only Tim Reiterman will talk about it, but then lies about "lack of substantiation." Here is the first of the last four exposes by my father, which the Examiner editors censored, because they were so terrified by Jones's legal muscleman Tim Stoen. Decide for yourself if "substantiation" problems rest with my father, or creative writer Reiterman. Ukiah, Calif. September, 1972 - - The sister and former husband of the late Maxine Harpe, who was found hanging in her garage here in March of 1970 have asked the Attorney General's office to investigate the disposition of $2400 belonging to Mrs. Harpe -- which they allege was placed in a trust fund set up by the People's Temple Christian (Disciples) Church. Daniel Harpe, a local resident, and Mrs. William Key of Citrus Heights near Sacramento, in a joint letter to the Attorney General's office, asked that the People's Temple be required to release this trust fund set up for Mrs. Harpe's three children, who are now in custody of their father. Their letter encloses a photostatic copy of a $2400 check issued by the Redwood Title Company as part of the proceeds of the sale of the Harpe's former home. The check is endorsed by Mrs. Harpe -- as well as by James Randolph, a member of the People's Temple. Randolph is a social worker for the Mendocino County Department of Welfare who, the letter says, was "keeping company" with Mrs. Harpe at the time of her death, which the County Coroner's office ruled as suicide. * That Harpe asked Mendocino County Sheriff Reno Bartolemei for assistance in recovering the $2400 from the People's Temple trust fund - - but that the Sheriff had replied that he didn't know anything about it; even though Harpe has since heard that the Sheriff is a trustee of this trust fund. * That Mrs. Harpe had attended the People's Temple for more than a year prior to her death - - and that she had definitely sought advice from District Attorney Stoen. "The woman (Mrs. Harpe) referred to - - was not, incidentally a member of my church -- was somebody I did not know, had never talked with and certainly never counseled." Stoen's statement in the Ukiah Daily Journal also took obvious issue with The Examiner's reporting of his relationship to and statements about the Rev. Jim Jones, charismatic pastor of the People's Temple. "I never said at any time that I saw 40 people raised from the dead." "People's Temple Christian Church does not, as far as I know, advertise that Jim Jones raises people from the dead." "Pastor Jones walked to the dead man and commanded 'Arise!' Instantly the man was resurrected before thousands there." Stoen was not available for comment, as the District Attorney's office said that he began a five-week vacation. Stoen's boss, District Attorney Duncan James, declined comment when asked if he had been fired. James also declined comment on a report by The Indianapolis Star which concerned an alleged telephone threat, which was attributed to Stoen's wife, Grace. The Indianapolis newspaper quoted Mrs. Cecil Johnson (whose daughters, Mildred and Gwin, recently left the People's Temple to return home to Indianapolis) as saying that she recognized Mrs. Stoen's voice during a 6:15 a.m. long distance telephone call last week. "The newspaper out here is harassing Jim. Your parents have signed something saying bad things about the Temple. You find out what they did and call me back. Get them to stop it. It's for your own safety." Mrs. Stoen was one of some 150 People's Temple members who picketed The Examiner last week. When asked about the alleged phone call, she declined comment. But Mrs. Stoen told a TV interviewer that her husband was an ordained minister -- which she had denied, when asked during a People's Temple service the previous Sunday in San Francisco. Her husband also told The Examiner, the following evening, that he was not ordained. The issue arose over Stoen's admission that he had officiated at the marriage of one of the Johnson sisters, Mildred, despite the fact that Section 4100 of the Civil Code requires that in order to solemnize a marriage, the officiant must either be ordained or a judge. "I meet all the requirements of the Civil Code," but was unable at the time of this interview to state which section of the Code he had in mind. "I am not only a duly authorized minister of my church, I have been ordained in another, and I have taken theological studies including two years of New Testament Greek." Stoen's statement did not identify this other denomination which he claims had ordained him, nor does his statement provide any such information as to where, when, or by whom he was ordained. 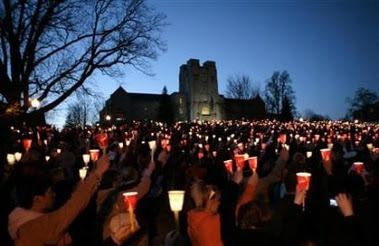 While I find the information posted in this blog regarding "The People's Temple" quite informative, I fail to see the relevance of bringing up the NRA while adressing the lack of descretion exercised by MSNBC for airing the Virginia Tech killer's "Press Package". It seems to blur the author's objective. Is the point to highlight a current incident of media negligence and draw a parallel to those of the past surrounding the actions of the "People's Temple" or attack a lobby group unrelated to either incident? The questions that arise in my mind was not what the modus operendi was of the VT killer, and how guns could have been kept out of his hands, but why the police and admistrators allowed "Business as Usual" on campus after the first shooting? Two hours went by between shooting number one and shooting number two yet classes were allowed to continue? If we were to dig further we are told that the killer left a trail of warning signs dating back two years. These including stalking incidents, threating writings, and mental health issues, yet he was not so much as called in for a repremand let alone put on probation. This Korean student was a ticking time bomb in every was that Jim Jones and his cult was. But at least in this instance the powers that be, the media, and anyone else involved were only negligent or incompetent and not complicit with the crime. 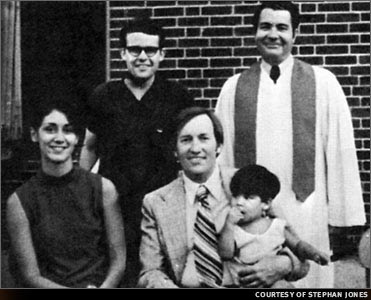 I believe the "unknown man" holding John Victor Stoen on his lap in the photo of Jones & the Stoens posted on your blog (twice) is Michael Prokes, a longtime Jones/People's Temple PR man who shot himself in the head after giving a press conference at a Motel 6 in Modesto, CA a few months after the Jonestown massacre. Prokes left a 42-page statement in which he claimed to have joined the Temple with the intention of writing a book about it & also that he had been paid by some covert government agency for information about the Temple. Prokes said he, instead, became a true believer, severed ties with said agency's contact & followed Jones. Prokes was so dedicated to Jones that he married one of Jones' favorite mistresses, Carolyn Layton, a school teacher & member of the church hierarchy, solely to legitimize the illegitimate son, Jim Jon "Kimo" Prokes, of Layton & the married Jones. Layton was one of the Rev. & Mrs. John Moore's daughters who died, along with her son, in Jonestown & the ex-wife of Larry Layton, the only person prosecuted for the ambush at the Port Kaituma airstrip where Congressman Ryan & others were shot & killed. Prokes escaped the Jonestown massacre because he & the Carter brothers were given the important task of delivering money & documents to the Russian Embassy in Georgetown that fateful day. The trio was apprehended before reaching their destination & the money, which they said they buried in the jungle because the suitcases were too heavy to carry, was never found.